Guacamole is one of those dishes that I often make for lunch when I find I have a couple of avocados ripening in the fruit bowl, and I want to use up some bits and pieces in the fridge. Of the many slight variations there are, I probably use one of the simplest recipes which is quick and easy. Husband loves it chunky; I like it smooth so I usually make it somewhere inbetween. Scoop the flesh of the avocados into a bowl and mash to desired consistency. Add all other ingredients and mix. 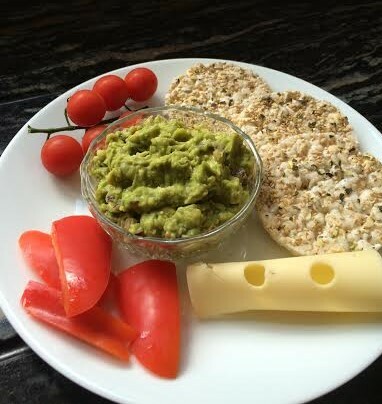 A light lunch – Guacamole with sliced pepper, vine tomatoes, Quinoa and Seed Rice Cakes and a slice of cheese. Try my Tortilla Chips with this guacamole – they make a perfect chip for dipping. 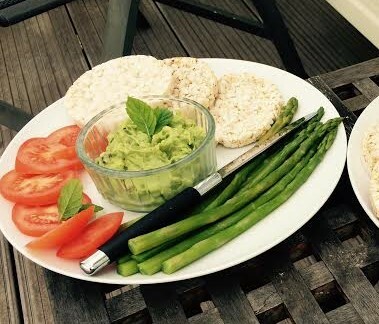 This entry was posted in Lunch, Miscellany and tagged Gluten Free, Guacamole, Healthy Eating, Lunch, Rice Cakes, Tomatoes, Wheat-Free. Bookmark the permalink.